Issued April 11, 2017, to Electronic Arts Inc. Playing EA’s Madden can be daunting because of the number of systems and strategies concurrently happening, especially for a person who does not understand American Football. The playcall selection menu can very be confusing to a novice who may not understand the differences between a running play and a passing play. 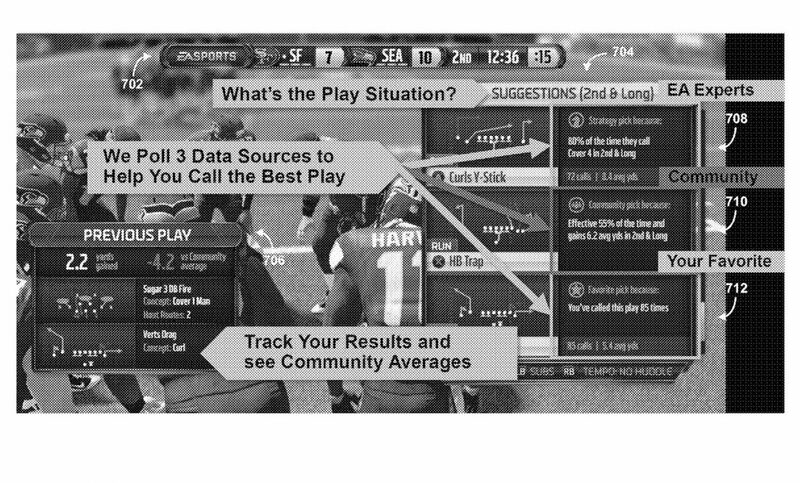 To help the player, Madden will provide suggested playcalls based on the situation, but early incarnations of the suggestion system were all based on pre-programmed suggestions. The game had no way of learning a players habits or adjusting the suggestion based on the opponent. U.S. Patent No.9,616,345 addresses this problem by creating a system and method to collect game play strategy data from online matches and use the data to adjust suggestions accordingly. Now, Madden will provide you suggestions not only based off your previous calls but also what you did in your previous matches as well as how other players handled similar situations. The game will even show you the number of times you have called a play and your success rate. 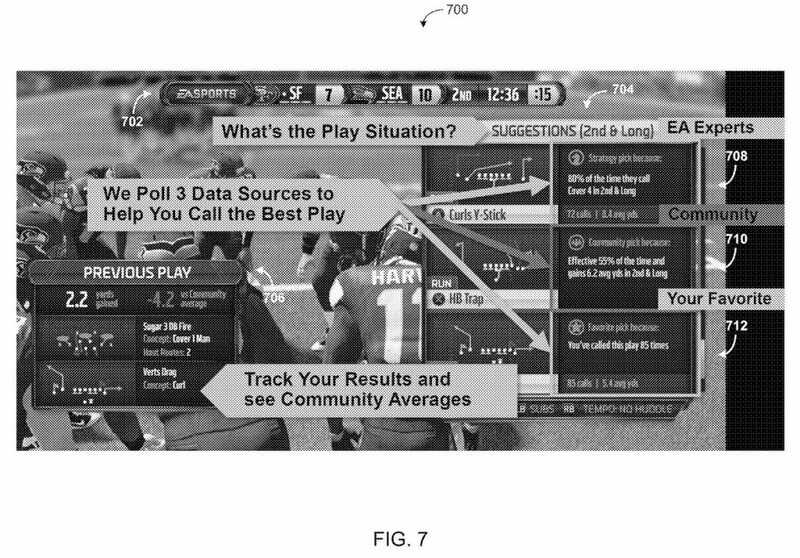 The patent also suggests that this data could be used to alter AI player strategy, but the primary focus of the patent is on playcall suggestions. Various embodiments provide systems and methods that collect data regarding game strategy decisions by human players during video game, and utilize the collected data to either adjust or replace behaviors of computer players and/or suggest game strategies to human players during video game sessions. The game strategy decisions may be harvested from human-vs-human and human-vs-computer video game sessions. The data may be harvested from online-connected video game sessions, which may be hosted over an online video game network. Depending on the embodiment, the harvested data can include information regarding game strategies used by players during the video game sessions, the game contexts in which the game strategies were respectively used, and the results achieved by the respective use of the game strategies. Systems and methods described herein may facilitate a computer player having behavior that is (at least partially) “crowd-sourced” based on game strategies used by online-connected video game sessions. 1. A method comprising: as implemented by a processor configured with computer-executable instructions, receiving first data from a first client device, the first data regarding a first game strategy used, by a first game player, in a first game context of a first video game session between the first game player and at least a second game player, the first video game session executing within a video game, the first game strategy being a playcall; updating a game strategy dataset based on the first data, the first data at least including an identity of the first game strategy and an association between the first game context and the first game strategy, the game strategy dataset including a set of one or more previous playcalls used in a set of one or more previous game contexts; receiving gameplay data from a second client device during a second gameplay session, the gameplay data identifying a second game context of the second video game session, the second video game session being between a third player and a fourth player; identifying in the game strategy dataset a set of one or more relevant game strategies based, at least in part, on the second game context during the second video game session, wherein individual game strategies are playcalls available for use within the second video game session; and transmitting to the second client device second data regarding the set of one or more relevant game strategies, the second client device being configured to use the second data to identify at least one suggested game strategy of the set of one or more relevant game strategies for use in the second game context of the second video game session, and generate instructions to output the at least one suggested game strategy within a video game user interface during the second video game session.